Prairie smoke, Geum triflorum, in bloom. Geum triflorum is a native North American perennial commonly called Prairie Smoke, for the appearance of the wispy seedheads. Other common names include Old Man’s Whiskers, Purple (or Red) Avens, Long-Plumed Avens, and Three-Flowered Avens. It is widely distributed across southern Canada and the central and northern U.S. in temperate and sub-arctic grasslands, and is hardy in zones 3-7. This prairie and open woodland wildflower in the rose family (Rosaceae) can be locally abundant on upland prairie sites. It is commonly found on shallow and gravelly sites as well as in silty and loamy soils. Unfortunately it has become rather rare over much of its range, out-competed by naturalized invaders and eliminated by development. Native Americans used this plant for medicinal purposes, including an infusion of the roots and crushed seed pods or pulverized roots as an eye wash, gargle for sore throat, and tonic for menstrual cramps and stomach complaints. Young shoots of Geum triflorum. The plants form a mound of foliage 6-10” tall, very gradually spreading by rhizomes. The leaves are pinnately compound with 9-19 rather crowded, narrow, toothed leaflets. The deeply cut, almost ferny leaves are semi-evergreen, with the foliage often turning red, purple and orange from late fall through winter. The leaves often look poor during the heat of the summer, but resume growth in late summer and fall to become a deep grey-green as other perennials are senescing for the season. When dry or during winter the leaves tend to lay flat on the ground, but perk up quickly when conditions improve. Prairie smoke is among the earliest bloomers on the prairie. It blooms in late spring through early summer, bearing clusters of nodding reddish-pink, maroon or purple flowers on 12-18” stems. There may be up to 9 flowers on each stem, but flowers generally occur in threes (hence the species name). The sepals of these globular flowers are fused, so they cannot open completely. There are 5 elongate, pointed sepal lobes on each ½ to ¾” flower. Bees have to force their way in to pollinate the flowers. The nodding pink flowers turn upright after pollination, then the styles elongate to form plumes. Fertilized flowers are later followed by distinctive silvery-pink fluffy fruits (called achenes) that are equally as decorative as the flowers, if not more so. The styles (parts of the female reproductive organs) greatly elongate in the fruit to form plumes nearly three inches long. After pollination the stems slowly turn upright, so that by the time the tufted fruit appear the feathery heads look like smoke wafting away from the plant – or something like the little “troll” dolls that once were so popular. The seedheads remain on the plant for many weeks until they become golden in color and very dry and are dispersed by the wind. They can be harvested and dried for use in flower arrangements. Pick the entire stem and hang upside down in a warm, dry place until dry. The wispy seedheads of prairie smoke are pink at first, but eventually dry out and fade to a golden color. Prairie smoke is not a particularly bright and showy garden ornamental, but the nodding, bud-like flowers and fluffy seedheads add interest in an informal garden. 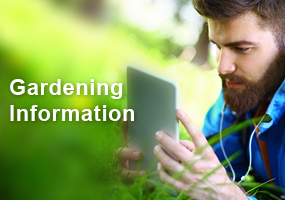 Since it is a relatively small plant, use it as an edging, place it in the front of flower beds, in sunny rock gardens, or other locations where it will not be hidden by other plants. It can be a good companion plant for spring flowering bulbs, filling in the areas when the bulbs die back. This plant is a good addition to meadows and prairies, although it may get lost among taller plants later in the season. It grows well in combination with other native plants that prefer dry summer conditions, including wild flax (Linum spp. ), prairie or grayheaded coneflower (Ratibida pinnata), blazing star (Liatris spicata and other species), sheep fescue (Festuca ovina), blue grama grass (Bouteloua gracilis), little blue stem (Schizachyrium scoparium) and Junegrass (Koeleria macrantha). In natural settings it often grows with upland white and silky aster (Aster ptarmicoides and A. sericeus, respectively), shooting star (Dodecatheon meadia), downy gentian (Gentiana puberulenta), Richardson’s alumroot (Heuchera richardsonii), tall blazing star (Liatris aspera), grooved flax (Linum sulcatum), purple prairie clover (Petalostemum purpureum), downy phlox (Phlox pilosa), rigid aster (Oligoneuron (=Solidago) rigida), and and various native grasses including Dichanthelium (=Panicum) oligosanthes scribnerianum and prairie dropseed (Sporobolus heterolepis). Prairie smoke clump in very early spring. Prairie smoke is tolerant of many soil types, growing equally well in sandy, loamy, and clay soils, although it prefers a well-drained site, in full sun. Flowering is reduced in shade. It likes a soil rich in organic matter, but also does well in the leaner soil of the rock garden, where it tends to be smaller in stature. Although it does not need a lot of water, it is not completely drought tolerant either. 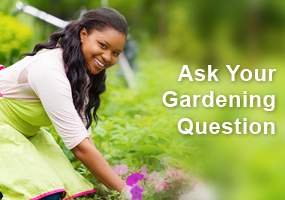 It needs moist conditions in spring, tolerates drier conditions in summer, and does not like to be wet in winter. A southern or western exposure is best. G. triflorum can be grown from seed sown in the spring. Seed started indoors should be stratified for 4-6 weeks. Plants started inside in late February should be ready to plant outside in late May. Autumn sowing outdoors can be successful and this plant may also self-seed, but it is a poor competitor, so is easily out-competed by other more aggressive native or introduced plants. 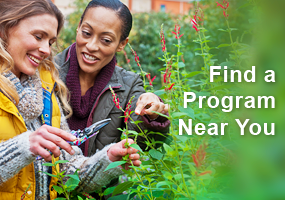 To encourage volunteer seedlings, keep other plants from growing too close to the seedlings. 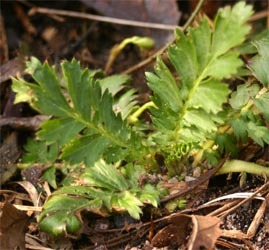 Plants can be propagated by division in early spring, after flowering or in the fall. Large clumps in gardens can be divided every 3-4 years to maintain vigor, but those established in prairies can be left alone. This would be an interesting addition to spring bulbs. I love the color and texture of the seed heads! 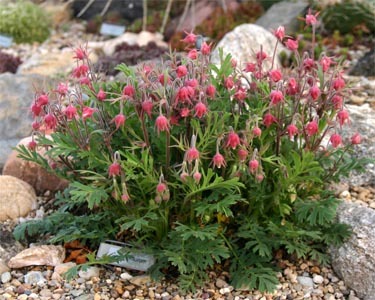 I would like to get the seeds for Prairie Smoke and start them indoors. I looked up stratification so I think I would like to try this. Starting the seeds outdoors would take too much time, and we have so many weed seeds blowing around in our area. 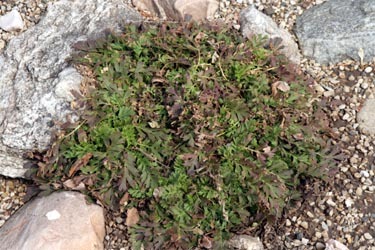 My Prairie Smoke has struggled for the past few years, after reading this article I will definitely be moving them from their eastern, over-crowded location to a more open spaced area. The competition seems to be doing them in!